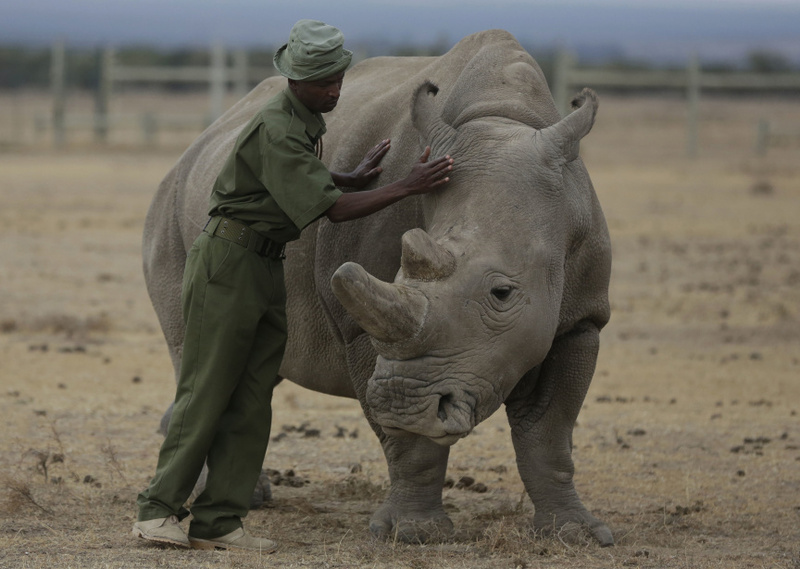 BERLIN (AP) — Scientists say they're several steps closer to perfecting a method that could prevent the extinction of northern white rhinos, of which only two animals are known still to be alive. It's the first time such hybrid embryos have been created and the scientists from Germany, Italy and the Czech Republic say it could provide a pathway to saving the critically endangered northern white rhino after the last male, called Sudan, died in March. They plan to harvest the egg cells of the two surviving female rhinos soon and use preserved sperm to produce "pure" northern white rhino embryos. Since the females, a mother and daughter called Najin and Fatu, are unable to bear offspring themselves, the embryos would be implanted in a southern white rhino surrogate. In order to increase the supply of eggs and preserve the northern white rhino's genetic diversity, scientists are also working on a second method that would coax frozen skin cells from deceased animals into becoming egg cells, a procedure that has already succeeded in mice. "We are quite confident with the technology we have developed," he said during a telephone conference with reporters detailing the research. "I have no doubt that its purely scientific merit is laudable and it might have some application to endangered species conservation in the future," said Richard Kock, a conservationist at Britain's Royal Veterinary College who has worked extensively in Africa. "But I am afraid it is very much Nero fiddling after Rome is burning with respect to (northern) white rhino." "Assisted reproductive technologies are very expensive and their success is far from guaranteed. Meanwhile, we don't have enough funding to conserve the other four rhino species, all of which are more threatened with extinction than the white rhino," said Bob Smith, director of the Durrell Institute of Conservation and Ecology at the University of Kent, England. Hildebrandt insisted the effort is worthwhile. "The northern white rhino didn't fail in evolution," he said. "It failed because it's not bulletproof. It was slaughtered by criminals which went for the horn because the horn costs more than gold." The rhino's disappearance has left a void in the region's ecosystem that could have significant impacts in the future, Hildebrandt said. "We have the tools in our hands to correct that." While the scientists are confident about being able to harvest eggs from the two females, questions remain over the risk to the rare animals' health. "We as scientists are highly afraid that something unexpected happens during that procedure," said Hildebrandt. "That would be a nightmare."